Electric vehicles are here to stay, there’s very little doubt about that at this point, but which automakers are making sure that EVs are not a fad, but a trend? A new report from EV-Sales, a website tracking electric vehicle sales through car registration data, compiled the top automotive groups selling EVs in volume. The Renault-Nissan partnership is the undeniable leader with 27% of the EV market since its resurgence and 18% in 2015. 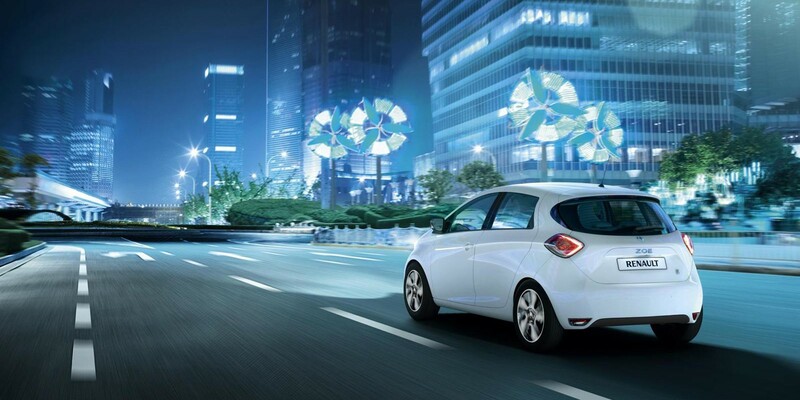 The success of Renault’s Zoe in Europe and Nissan’s LEAF worldwide continue to be an important driver of the electric vehicle market. LEAF sales started to lag recently ahead of the launch of the 2016 model, but sales should pickup in the coming months as the new model arrive at dealerships. The group is truly committed to electric cars and is expected to improve on their current EV platforms for future models with more range. A very encouraging fact from the data is that VW, BYD and BMW all sold more EVs this year alone than they did through all the prior years combined. This means we are witnessing the first steps of these majors brands in the EV market. It’s also impressing to think that most of these sales are only from one model per company: VW with the Volkswagen e-Golf, BYD with the Qin and BMW with the i3. Each brand is planning more models in the near future which should help global EV sales. Speaking of ‘one model brands’, Tesla Motors is pulling its weight while only selling its high-end sedan, the Model S. The company is consistently at the top of EV sales even though its only car starts at $70,000. Yesterday, Tesla began converting its backlog of reservations into orders by bringing its design studio online for the Model X, its second vehicle utilizing the Model S platform. The backlog could have as much as 24,000 reservations and deliveries should start later this month. 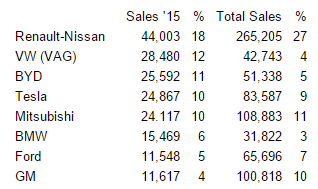 It will be interesting to follow market shares as each brand adds more models to their EV lineups.